Starting your Nursing Career as a Newly Qualified Registered Nurse is an exciting time but we realise it is natural to feel a bit apprehensive and uncertain of what to expect. 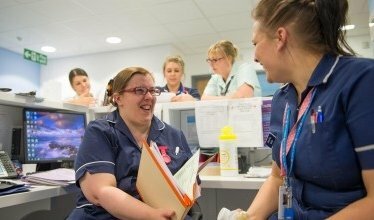 Your Nursing Preceptorship programme will support you in adapting to your new role and in your transition from Student Nurse to competent registrant. The 12 month programme will provide you with a range of information, knowledge and skills consisting of the following elements. Trust Induction: Undertaken during the first 12 weeks of employment, covering, local and Trust induction mandatory and statutory training with a broad introduction to the Trust. Six designated Preceptorship study days covering, Communication, Documentation, Quality and Safety, Accountability and Professionalism and Leadership. A “Maintaining Patient Safety “workshop covering core knowledge and skills to support the assessment and delivery of safe patient care. Drugs and Insulin administration on line learning modules. assessments which you will work through in the first 12 months of employment. To enable effective orientation and induction to your ward you will have a period of supernumery/ supervisory status and beallocated a designated preceptor who will be a point of contact and guidance. The full details of your Preceptorship programme will be sent you before you start with us.